Portage Park's dinner & weekend brunch spot! We are a small neighborhood bistro specializing in housemade charcuterie, smoked and cured meats and fish, fresh pastas and handmade pizzas, and seasonal vegetables. Our cooking is inspired by hand-crafted old world technique using local ingredients. Chef Matt Saccaro has a rich culinary background from both the Jewish & Italian sides of his family and he seamlessly combines these two traditions in our diverse menu. We are committed to providing the best possible experience to our community and look forward to serving you! 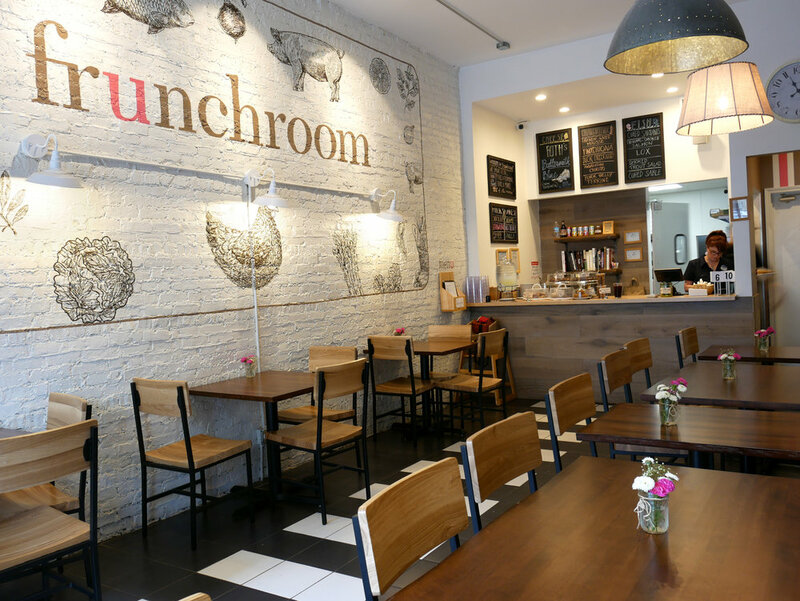 In case you're wondering: the term "frunchroom" is classic Chicago slang for "front room", the living room of a house (especially the bungalow) used to welcome and entertain guests, hang out, share food, drink wine, etc. We are BYOB so come on in and make yourself at home! We are also available for catering, private events, dinner parties, etc. with selected and prix fixe menus. Email Chef Matt Saccaro at frunchroomchicago@gmail.com with your ideas! DINNER RESERVATIONS: give us a call during our open hours or leave us a voicemail or email message with your preferred time, number of people, and phone number and we’ll get back to you within 24 hours. Please note that ONLY complete parties will be seated, as we are a tiny restaurant that needs to give priority to those present. Thank you for understanding! zarlengo's "real fruit italian ice"
breakfast sandwiches - on ciabatta with over-easy egg "
**BYOB corkage fees not only help to cover glassware (breakage, washing, polishing, stocking) and the service of opening your bottle for you (so you don't look silly in front of your date! ha! ;) ) but it also helps to keep us in business as a BYOB! most restaurants with liquor licenses have their labor entirely paid for by the markups on alcohol, however we do not have that luxury as we are unable to obtain a liquor license. why, you ask? because we only have one restroom and the city of chicago requires that you have two in order to be sold a liquor license, no matter how tiny of a restaurant you happen to be. thank you for understanding! we are BYOB! we have housemade bloody mary mix and orange juice to accompany your favorite spirits & sparklings. we focus on what is available locally, seasonally, and organically; menu items and prices may vary.